A Wrinkle in Time is a 2003 Canadian-American made-for-television fantasy film directed by John Kent Harrison from a teleplay by Susan Shilliday based on the 1962 novel of the same name by Madeleine L'Engle. It is produced by Walt Disney Television, Dimension Television, Fireworks Entertainment, and The Kerner Entertainment Company. The film stars Katie Stuart, Gregory Smith, David Dorfman, Chris Potter, Kyle Secor, Seán Cullen, Sarah-Jane Redmond, Kate Nelligan, Alison Elliot, and Alfre Woodard. Although footage from the project appeared in a trailer on Spy Kids DVD and VHS copies as early as 2001, broadcast of the completed film was delayed several times; it finally aired in the United States on ABC May 10, 2004. The film received negative reviews. A Wrinkle in Time premiered at the Toronto Children's film Festival on April 24, 2003, where it won the Best Feature Film Award. From left: David Dorfman as Charles Wallace Murry, Katie Stuart as Meg Murry and Gregory Smith as Calvin O'Keefe on the planet Uriel. Meg Murry (Katie Stuart) is having a difficult time. Her father, astrophysicist Dr. Jack Murry (Chris Potter), has mysteriously disappeared. Her youngest brother, Charles Wallace (David Dorfman), a genius, is teased and belittled and thought to be stupid because he does not talk to anyone but family. Meg does not get along with her peers, teachers, her 10-year-old twin brothers (Munro Chambers, Thomas Chambers), or even with herself. Into this unhappy situation comes a stranger, the mysterious, weirdly dressed Mrs. Whatsit (Alfre Woodard), and her friends Mrs. Who (Alison Elliott) and Mrs. Which (Kate Nelligan). They take Meg, Charles Wallace, and their new friend Calvin O'Keefe (Gregory Smith) via tesseract to other planets, preparing the children for a mission to rescue Dr. Murry from the malevolent "IT" on the planet Camazotz. Along the way they ride on the back of a beautiful winged creature (the transformed Mrs. Whatsit), learn about the shadow of tangible evil known as the Black Thing, and visit the Happy Medium (Seán Cullen). Once they reach Camazotz, however, it is up to Meg, Calvin, and Charles Wallace to face the dangers of CENTRAL Central Intelligence, aided only by each other and a pair of Mrs. Who's glasses. They do find and rescue Dr. Murry, but Charles Wallace is seduced away from his family by IT's agent, the Man with Red Eyes (Kyle Secor), and thus comes under the control of IT. Dr. Murry manages to tesser himself, Meg and Calvin, away from Camazotz, but Charles Wallace is left behind, trapped in the mind of IT. Angry with her father, Calvin and herself for leaving Charles Wallace behind, Meg is cared for by the sightless and motherly Aunt Beast (Ellen Dubin) on the planet Ixchel and argues with Mrs. Which about returning to rescue her brother. Returning alone to Camazotz, Meg must find a quality in herself—love—to free Charles Wallace, and possibly free the planet Camazotz as well. A Wrinkle in Time received generally negative reviews from film critics. In a Q&A with MSNBC/Newsweek Entertainment reporter Melinda Henneberger, author L'Engle said of the film "I have glimpsed it... I expected it to be bad, and it is." A Wrinkle in Time premiered at the Toronto Children's Film Festival, where it won the festival's 2003 Best Feature Film Award. 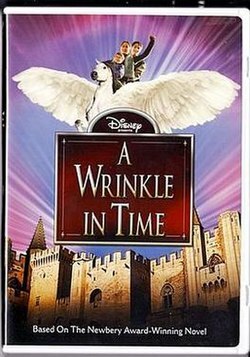 Originally produced as a television miniseries, A Wrinkle in Time was at one point intended to air on The Wonderful World of Disney for two nights in February 2002. It was postponed, however, rescheduled for February 2003, postponed again, cut to 128 minutes, and aired in a single three-hour block on ABC May 10, 2004. A Wrinkle in Time was released on VHS and DVD November 16, 2004 by Buena Vista Home Entertainment. The special features included deleted scenes, a "behind the scenes" segment, and a "very rare" interview with Madeleine L'Engle who discusses the novel. The home video rights to the film have since been obtained by Echo Bridge Home Entertainment, which has released the title both as a standalone DVD and as part of several family film bundles. ^ a b "A Wrinkle in Time DVD Review". UltimateDisney.com. November 2004. Archived from the original on 30 December 2006. Retrieved December 9, 2006. ^ "I Dare You: Madeleine L'Engle on God, 'The Da Vinci Code' and aging well". www.newsweek.com. May 7, 2006. Retrieved January 8, 2009. ^ "News: Announcements and Press". madeleinelengle.com. Crosswicks Ltd. March 31, 2005. Archived from the original on 2006-12-12. Retrieved 2006-12-10. ^ A Wrinkle in Time (DVD ed.). November 16, 2004. ISBN 0-7888-4336-2.